The date all boxing fans have been waiting for has been tentatively set. A contract has been drafted and the world waits to see Manny Pacquiao v Floyd Mayweather Jr. in a World Boxing Counsel (WBC) Super Welterweight World Championship bout. The event is slated for November of 2011 and awaits signatures…but hold on just a minute. Put the phone down. Delete that post on Facebook and hold off on Tweeting. We are all looking forward to sharing the good news, but should know better than to celebrate prematurely. Not surprisingly, negotiations have hit another speed bump, and this time it has nothing to do with defamatory accusations or drug testing. The unlikely agreement was proposed by Zindsi Mandela, daughter of Nelson Mandela, as a gift in celebration of her father’s 93rd birthday. Nelson Mandela himself started boxing while attending college at Fort Hare University in Eastern Cape. He is also known for his 27 years of shadow boxing behind bars for suspicion of treason in apartheid ridden South Africa. For those who don’t know the story, he then went on to become South Africa’s first black president. He is also rumored to be a Pacquiao fan. According to promoter Duane Moody of Imagine That Entertainment and Event Management (Imagine That) in Los Angeles, Ms. Mandela approached Moody about putting together the big fight. Mandela and Moody entered into a business arrangement, the terms of which required Moody to organize a meeting to entice Mayweather to agree to the bout with Pacquiao. In exchange for his services Moody was promised fifteen percent of the proceeds from the event, which has an estimated worth of $100 million. Moody and Imagine That are now bringing causes of action against Mandela for breach of oral contract, promise without the intent to perform and negligent misrepresentation. The meeting with Mayweather took place in Las Vegas some time between February and March. According to Moody, the meeting was a success and Mayweather agreed to the fight pending the signing of a final agreement. The agreement for the bout titled “Winter Storm 2011,” guarantees each fighter a minimum purse of $25 million. It was said to take place in South Africa and be co-promoted by Mohlaleng Media (a South African corporation) and Top Rank Boxing. Top Rank Boxing Public Relations Manager Lee Samuels told boxing insider the he had read about the possibility of the fight on the internet, but other than that he didn’t have any information. “We have would love to have Pacquiao against Mayweather,” said Samuels, “and we have been trying to make it happen.” As of now Top Rank is not involved in any efforts to push the South Africa event and has no signed agreement. According to the complaint filed April 15, 2011 by Moody, things began to get suspicious before he was even out of Las Vegas. The complaint asserts that Moody and the group of individuals being hosted by Mandela were asked to leave their hotel because Mandela had not paid for their accommodations as agreed. Moody then requested a plane ticket back to California which he was given a conformation code for. When Moody reached the airport he was told the ticket was not paid for and he would have to pay to board the plane. Shortly after the hotel and plane incident, The Nelson Mandela Foundation sent confirmation letters to the fighters. The letters asked for confirmation and extended an invitation for the fighters to come to South Africa in July for “Nelson Mandela Day,” and the official announcement of the fight. The celebration corresponds with Nelson Mandela’s birthday on July 18. The complaint asserts that Ms. Mandela has failed to produce the necessary funds to secure the event or services rendered. She has also failed to finalize the agreement for the bout. Along with Mandela, the plaintiffs are also bringing the case against DOES 1-50, which means defendants whom are people presumed to be involved in the case, but whose identities are currently unknown. The term is a plural and gender neutral adaptation of the phrase “John Doe” or “Jane Doe.” The DOES will likely include those who Mandela was in the process of securing funds from. Moody and Imagine That are first making a legal assertion for breach of contract. It appears that the contract between Moody and Mandela was not reduced to writing and instead was an oral agreement. Often a contract of this magnitude falls subject to the Statute of Frauds, meaning that it must be memorialized in writing to be valid. This not necessary under the given circumstance since the contract was set to take place within the year and was not for the sale of goods. Therefore the oral contract may be found enforceable. As a side note, it is always a safer to get everything in writing. Moody asserts that Mandela breached the contract in failing to hold up her end of the deal. She was allegedly responsible for paying for the hotel and plane accommodations and has failed to pay the estimated fifteen percent of event proceeds totaling $7,500,000 to Moody and Imagine That. They are asking the court for that amount in damages plus interest. The plaintiffs believe that Mandela never had sufficient funds for the deal to begin with. That important bit of information was not disclosed prior to the agreement and therefore the second cause of action is for “promise without the intent to perform.” In reliance on Mandela’s promise of the funding, Moody held up his part of the deal in securing the meeting with Mayweather. Had Moody known of the lack of financial backing he would not have made the contacts, flown to Las Vegas, set up the meeting, etc. On this count he and Imagine that are looking to recover actual damages plus interest and punitive damages. The final claim of “negligent misrepresentation” is alleged under the pretenses that Mandela falsely represented to Moody that she had the ability to perform the contract. Moody acted on this representation to his detriment as it cost him time and money to secure his end of the deal. The case was filed in Los Angles which will likely be found a valid jurisdiction because it is where the plaintiffs are located and where the oral agreement was made. The case management conference is still four months away. Who knows what could happen in four months. Maybe Ms. Mandela will acquire the necessary funds. Maybe the two fighters will put all their other issues aside. 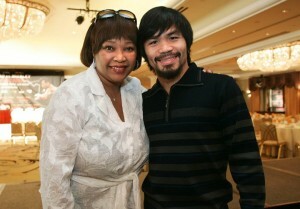 Maybe Nelson Mandela will receive arguably the best gift a man can hope for, Pacquiao v Mayweather in his own back yard. Fans probably shouldn’t hold their breath. . . but should apply for their passport now just in case.